The Xenotest Alpha+ is a compact stand-alone rotating rack xenon instrument with 1320 cm2 exposure area. It comes with a complete set of parameter controls. Irradiance and temperature are measured and controlled directly on the sample level using on-rack XENOSENSIV sensor technology. The Alpha+ complies with the vast majority of industry standards setting the benchmark in narrow tolerance testing. 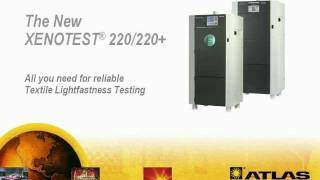 Due to its highly reliable performance and high irradiance capabilities, it‘s often chosen by R&D departments or commercial Service Test Houses. Accessory kit "Textile ISO 105"
Set of cover masks "Special"